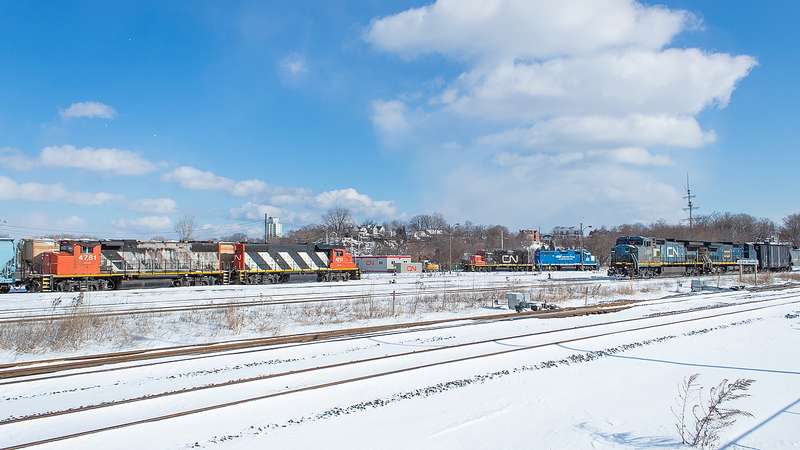 Railpictures.ca - James Knott Photo: More snow fell last night, making for the second Sunday in a row with fresh snow and nice sunny skies. Before entering the yard, 331 spoke with the trainmaster to make sure the yard crews were out of the way. Lucky for me, the one crew on duty at the time was having their lunch and their power (4781 and 4713) was tied down allowing for this shot. 330 and 331 seem to be pretty reliable for having interesting power. | Railpictures.ca – Canadian Railway Photography – photographie ferroviaire Canadienne. Caption: More snow fell last night, making for the second Sunday in a row with fresh snow and nice sunny skies. Before entering the yard, 331 spoke with the trainmaster to make sure the yard crews were out of the way. Lucky for me, the one crew on duty at the time was having their lunch and their power (4781 and 4713) was tied down allowing for this shot. 330 and 331 seem to be pretty reliable for having interesting power.